Lonely sights open in the forest, a short film by David Hartt that will be unveiled in an exhibition at the Graham Foundation. An airplane flies across the otherwise silent (even though it is midday) city, construction workers work atop a roof, a pool full of water (yet empty of humans) fills the screen, and one car drives past rows of those parked. 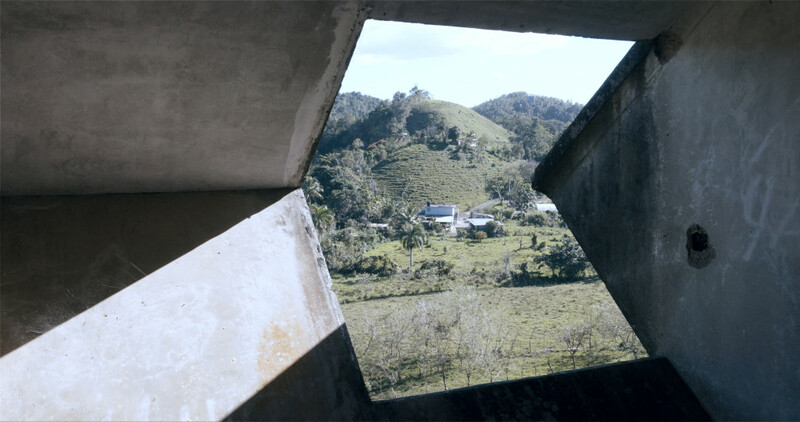 The desolation in crowded San Juan is quickly exchanged for scenes of Habitat Puerto Rico, an abandoned project by architect Moshe Safdie, that has been entirely reclaimed by the mountainside. Alongside this film, Hartt utilizes a multitude of mediums—photography, installation, sculpture, sound—while focusing on very specific chosen sites. I sat down with Hartt to talk about the film, the process of selecting these sites, and the ability of one place to project various ideological perspectives, among other things. Gabrielle Welsh: I want to talk more about the Chicago exhibit. With in the forest, the work ranges from flat mediums to installation. Please walk us through the exhibit and your process of installing. David Hartt: Well, I mean, the work that I am doing now stems from a turn I took in my practice in 2008, and that was after almost a ten-year hiatus. So, in 2008, when I started making work again, the first exhibition I had was in Seattle. After that, I did the show Stray Light at the MCA in Chicago in 2011. And pretty much since 2010, I have been working in installation, so, the work has been pretty consistent in thinking spatially about a kind of expression of my ideas, and trying to create a total environment that can dimensionalize a concept. I think of the exhibition interval, which was an installation at the Art Institute of Chicago in 2015, as definitely my most ambitious work. But I think since then, in the forest, goes several steps further in terms of, thinking beyond a singular space. So, even though the exhibition interval was quite vast, in terms of its footprint, in the forest, utilizes the entirety of the Graham Foundation. David Hartt, still from in the forest, 2017. 4K Digital Video File, color, sound; 20 min. Courtesy of Corbett vs. Dempsey and commissioned by the Graham Foundation for Advanced Studies in the Fine Arts. There are four galleries total, spread across two floors. In thinking about space and the work, it was really important for there to be a level of continuity and integration in the viewer’s experience of the piece; so, when you walk into one gallery you do not experience the totality of the exhibition. Instead, you get the sense of it unfolding as you move through the space. And not only that, even the way that we did the audio mix really played with spatialization—there is a degree of call and response in the mix, and you have a sense that things are happening in other parts of the building. I actually set up the audio in my house here in Philadelphia across two floors, and when it panned through the space, it really made it come alive in a way that I had never experienced architecture before. You got a sense of your specific physical presence within the space in relationship to the overall volume of the structure. Things were happening and apparent in other parts of the building. In terms of the elements, there is a suite of seven photographs that are arrayed in different galleries. There are thirty ceramic elements, which are dual-purpose depending on their orientation. In one direction, they function as planters. 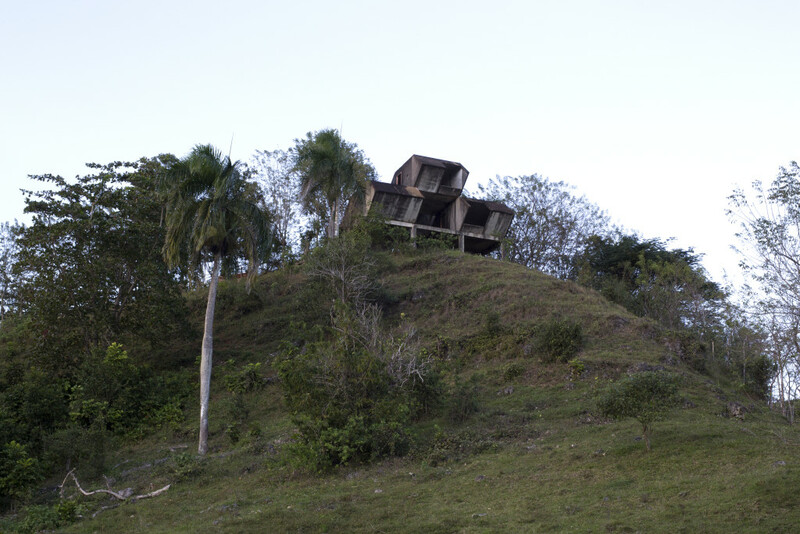 There is a host of tropical plants native to Puerto Rico that are in these. The other orientation is a seating element, as a stool. And then there are a series of five laser cut, bent, and powder-coated aluminum structures, which are reminiscent of the roof line from the original Safdie architecture. These pieces are on both floors as well as outside in the courtyard of the Graham. There is also, of course, the 20-minute film, and all the dispersed audio equipment, which plays a mixture of the recordings I made in Puerto Rico as well as a score that was composed by Karl Fousek, a Montreal-based electronic musician. 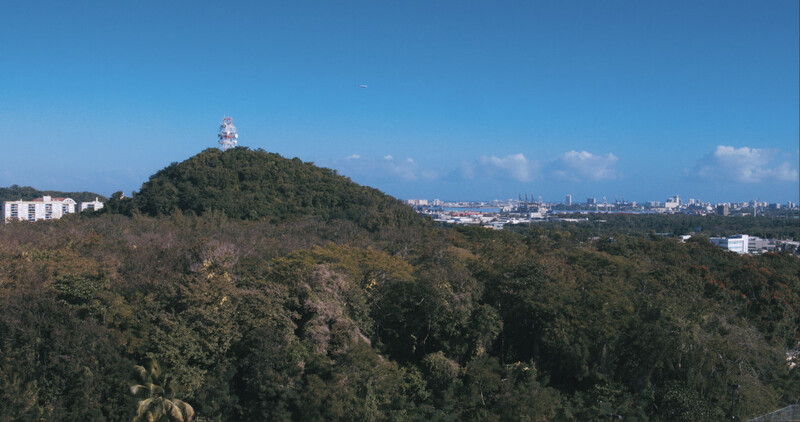 David Hartt, Camuy II, 2017, archival pigment print mounted to Dibond, print size 36 x 54 inches. Courtesy of Corbett vs. Dempsey and commissioned by the Graham Foundation for Advanced Studies in the Fine Arts. I guess a last element, too is the house and in it there were a number of dichotomies or binaries that I was trying to erase. In considering the location [of the Graham Foundation]—the house, historically what was a private residence became a public institution. Then there is the way that the interior garden functions in relationship to the exterior landscape of Chicago. The windows are wide open, not physically open, but letting in as much light as they possibly can. There is a kind of reciprocity between the exterior vegetation and the interior. There is also the geographic north/south axis, you think about issues of colonialism and narratives of identity. I was trying to create a more hybrid experience where those binaries are collapsed or blurred. GW: To build on this conversation of dichotomies, I am thinking about the dichotomy of success and failure. Looking at Habitat 67, it was wildly successful as an architectural feat but it was never affordable. However, Habitat Puerto Rice, while never finished has been reclaimed into its landscapes. How are you working through or viewing these different projects as success versus failure? DH: I am trying to again, avoid these dichotomies. I don’t see them in these binary conditions. Although there is a kind of really healthy dialectic that is being implied. I was more concerned about the notion of nation-building, and how Moshe Safdi’s Habitat 67 was iconic in its ability to channel the spirit of Canadian identity that was emerging at that point—it was an assertion of modernity. It was speculative, meaning that it advanced the technologies that allowed its construction to happen, and it was a way of asserting their independence vis-à-vis a colonial history in relationship to Great Britain. [Habitat 67] was saying ‘Canada is a modern state and we’re using modern design and technology to assert our presence and values on an international stage.’ It marked a demarcation between the past and present. So, you look at that, and then you look at Puerto Rico. Even in its current status, it is still a colony, on the verge of bankruptcy with serious issues: unemployment and poverty. There is quite an antagonist relationship with the United States. For me, that is the dialectic that begins to emerge in trying to understand the histories of the sites in relation to the contexts—the social, the political, the economic—that they find themselves in. To say that one is a success and one is a failure is simplifying something that I want to stay complicated. 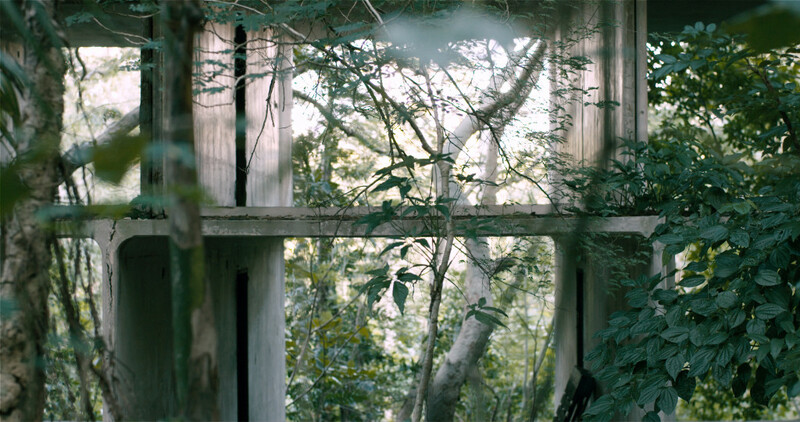 [in the forest] is trying to recognize the society that hosts the structure and then trying to understand it in relation to the structure itself. Because of the fortunate coincidence of the pairing of these, we begin to understand each society: their choices and their presence in relation to each other. GW: And in talking about these spaces, your research and the work you produce is very geographically driven. What is the relationship between the spaces your research takes place in, the sites you choose, and eventually the spaces of display? DH: Oh that is a great question. I mean, the first part I have considered a lot. The last part is more or less arbitrary. I am never drawn to a site specifically; although I will as I come across sites that are interesting take note of them. I’m not necessarily drawn to a space because of its specific history or the way it presents itself visually, in advance of a concept. I am however really interested in how I can use artistic practice as a means of scholarship and research, in terms of investigating contested ideas. So, one example is this notion of sovereignty. When we think of sovereignty today, its meaning is shifting. There is the concept of sovereignty as representation of statehood; as a promise of what that means, in terms of stability—economic stability, security, rule of law, etc. And the promises that the state has made have shifted and changed with the rise of neoliberalism. What is our relationship to sovereignty on that level? What is our relationship with the sovereignty of failed states? You have countries like Yugoslavia, where the domain name .YU persisted almost 20 years after the collapse of the country itself. You have the idea of environmental catastrophe, which threatens the borders of many countries. I actually went to the island of Tuvalu, in the south Pacific, to make a film several years ago. Not because I was interested in global warming or even necessarily the plight of the Tuvalese, though I am not insensitive to it, but as an expression of the changing nature of sovereignty. What happens to the identity of a people when the country that they identified with collapses and disappears? This idea is the thing I am trying to dimensionalize and stabilize through my scholarship and research. And what I try and do is find a site, a kind of singularity, which is a deep expression of that idea. So in this sense, I went to the island, where the concept of sovereignty is deeply under threat. Or in terms of trying to understand the experience of what it means to be Black in America—the history of slavery, and economic oppression, the struggle for civil rights, and the eventual emergence of the modern African-American. I went and made a work at the headquarters of Johnson Publishing. So, each of these sites are singularities in that they are deeply expressive of a specific ideological or intellectual worldview. That is what motivates the choice in sites, and I am never absolutely positive that it will yield something of visual interest. Sometimes it is deeply underwhelming. When I went to the Mackinac Center for Public Policy, which is a free market think tank. It is an office park—the walls are beige, it is office depot chic. But then you go to a place like Johnson Publishing and you’re completely overwhelmed with how rich and complicated an environment it is. For me, that is really exciting. Not trying to select a site to try and make it mean something, but instead have a clear concept in advance and really the exciting part of artistic practice is engagement with that site and trying to really wrestle meaning out of it. That talks a lot about that process of selection. In terms of the choice of venues, that is always really complicated for me and I have started to understand it better, as it relates to the long-term life of a piece. So, I have had really happy occurrences, for instance, the Stray Light work, it toured to four cities. There was a particular resonance that it found both in Chicago and in New York at the Studio Museum, just in the ways that the work began to communicate with the local community—there were many shared interests. That is not to say it was any less successful when it went to Seattle at the Henry Museum, it just functioned differently. I think looking at the Graham Foundation, the show is touring. It goes to Toronto next year to Oakville Galleries, which is also a repurposed mansion on Lake Ontario. Again I was thinking through ideas of domestic space and that would have been consistent, but what I’m ideally hoping for is that this work finds a permanent home in an institution where it can actually speak to the history that’s being addressed. [in the forest] creates a dialogue and a conversation already just by virtue of the context that it finds itself in. 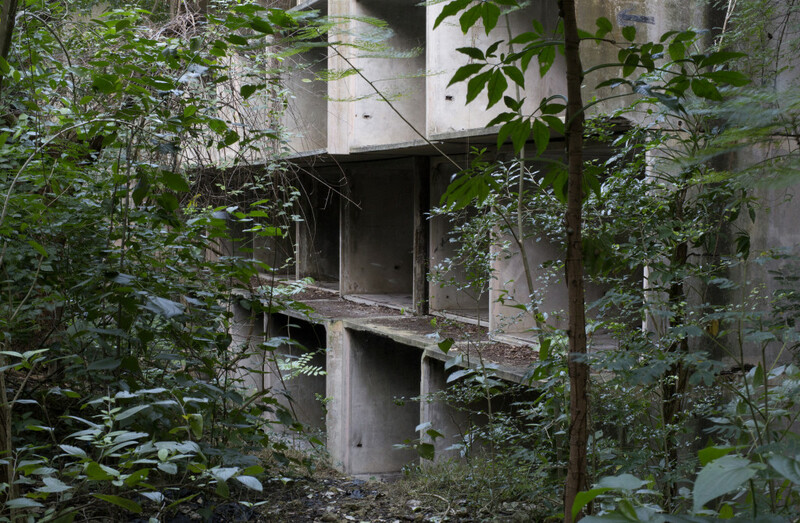 GW: in the forest aligns with the Chicago Architectural Biennial, and it is being installed in a architectural institution. How does this work speak to the history of architecture in both the sites its looking at and in Chicago? DH: Instead of architecture with a capital A, I am more interested in the concept of sites and the built environment because it is a more generous qualification. I’m not interested necessarily in authored spaces, and I am not necessarily trying to prioritize specific scales of construction. It can function at the level of an object, or of a room, or of a building, a street, a square, a neighborhood, a city, a region or even of a country. And I’ve worked at all of these scales in various pieces. David Hartt, Carolina I, 2017, archival pigment print mounted to Dibond, print size 36 x 54 inches. Courtesy of Corbett vs. Dempsey and commissioned by the Graham Foundation for Advanced Studies in the Fine Arts. For me, architecture or the built environment functions as a useful proxy for being able to address different kinds of ideological perspectives. There is a deep connection between the ideological purpose of a site and its outward expression—sometimes those things are quite explicit and other times they are deeply buried within. The work really tries to navigate and investigate how those ideas are expressed. And through that investigation, you begin to dimensionalize an idea, understand heuristically different kinds of investments, and uses; how an idea is either celebrated or hidden. in the forest at the Graham Foundation runs September 14, 2017 through January 6, 2018. David Hartt (b. 1967, Montréal) lives and works in Philadelphia where he is an Assistant Professor in the Department of Fine Arts at the University of Pennsylvania. Recent solo exhibitions have been held at The Art Institute of Chicago; LA><ART, Los Angeles; and Or Gallery, Vancouver. Additionally, his work has been included in several group exhibitions including Ocean of Images: New Photography 2015 at The Museum of Modern Art, America Is Hard to See at the Whitney Museum of American Art, and Shine a light/Surgir de l’ombre: Canadian Biennial at the National Gallery of Canada. His work is in the public collections of The Museum of Modern Art, New York; Whitney Museum of American Art, New York; The Studio Museum in Harlem, New York; The Art Institute of Chicago; Museum of Contemporary Art, Chicago; The Museum of Contemporary Photography, Chicago; Henry Art Gallery, Seattle; The National Gallery of Canada, Ottawa; and The Stedelijk Museum, Amsterdam. Hartt is the recipient of a 2015 Foundation for Contemporary Art Grant, in 2012 he was named a United States Artists Cruz Fellow and in 2011 he received a Louis Comfort Tiffany Foundation Award. August 31, 2017 | Filed under Art Seen: Chicago and tagged with David Hartt, Gabrielle Welsh, in the forest, The Graham Foundation.